Group III of the Ohio Wing Civil Air Patrol (CAP) – a United States Air Force auxiliary and a 501(c)(3) charity, operating in part as a youth leadership development program – recently sent 16 school-age CAP Cadets and 10 adult volunteers to assist the VSC of Summit County in retiring hundreds of worn and faded American flags. 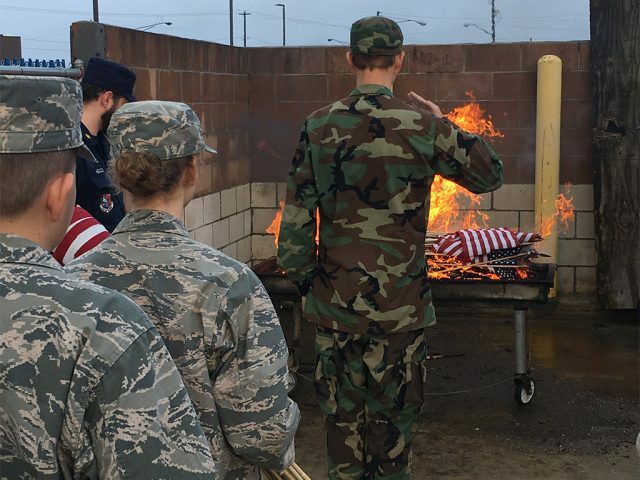 The event, which took place Oct. 6 at the VSC’s Akron headquarters, gave participants a chance to perform a valuable community service and facilitated a better understanding of how to show respect to an American flag that is no longer serviceable. That lesson begins with learning how to correctly describe a flag retirement ceremony, according to Michael Sidman, Assistant Cadet Activities Officer for the Ohio Wing CAP. According to Sidman, performing a proper flag retirement ceremony comes with “loose general guidance” as opposed to specific details. Much like other ceremonies, there are multiple versions of the right way to approach it. Each version ends with a display of respect, either by retiring the flag through burning or burial. Sidman praised the retirement ceremony as a valuable learning experience for participating Cadets and adult volunteers alike. More than that, it helped teach the next generation of Americans about what it means to be a good citizen. Since its formation during World War II, members of the CAP have served their communities through emergency response, aviation and ground services. Designed for young people ages 12 to 18, the CAP Cadet program helps to shape members into future leaders and better citizens and prepare them for careers in aviation, space or the military. To learn more about the Ohio Wing Civil Air Patrol, visit ohwg.cap.gov.